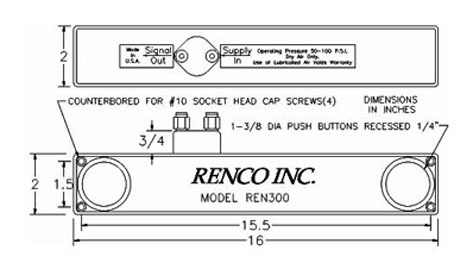 Compact design with 1-3/8″ push button (recessed 1/4″) on top. 1/4″ push lock fittings included (standard). Optional 5/32 (4 mm) push lock. Quick & simple installation, bolt the control down and plug your tubing into the 5/32″ (4 mm) push lock connections. 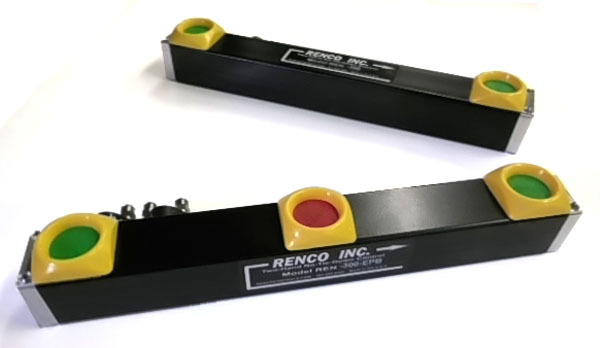 The series REN300 features top palm buttons that use our light touch valves. This allows the operator to keep his/her palms facing down. -EPB (EXTRA PUSH BUTTON) A center mounted N/C 3-way valve with button on top (guarded) has separate output marked EPB. -SWV Switch valve a center mounted toggle diverter valve that diverts the 2-hand output between 2 output ports. -P .4 second pulsed output. The palm buttons must be held the full time. -PA .1-30 seconds adjustable pulsed output. The palm buttons must be held the full time.